Following the Spending Review settlement, the Department for Transport was awarded £580 million (£80 million revenue and £500 million capital). The revenue element of this fund sits within the £300 million which the Chancellor announced as supporting cycling over the life time of this Parliament. The capital element will continue to be embedded in the Local Growth Fund (LGF) but Treasury have made it clear that this will not be ring-fenced. We are working with officials from Communities and Local Government, the Treasury and other Departments on the design of a competitive process for allocating the remaining Local Growth Fund. This will include discussion of how we can achieve national policy goals, such as sustainable travel, within LGF guidance and allocation criteria. Following the Spending Review, the Department was awarded £49.8 million over the next four years from 2016/17 to 2019/20 to support Bikeability training in schools. Bikeability provides children with the life skills they need to cycle safely and confidently on local roads. The programme remains one of the key strands to supporting the Government’s manifesto commitment to make cycling safer, so we reduce the number of cyclists and other road users killed or injured on our roads every year. The Department currently provides over £11 million a year in training grants for children and £715k a year in programme support costs. Grants are paid to local authorities and School Games Organisers (SGOs) to deliver the training. During the last parliament 1.3 million children in England (outside London) received Bikeability cycle training, and we expect to train a further 1 million children over the next four years with the new funding settlement. In 2014/15 DfT provided funding for a Transport Delivery Excellence programme to boost the capability of Local Enterprise Partnerships (LEPs) delivering of Local Growth Fund schemes. The TDEP consists of two parts: the core TDEP and the Sustainable TDEP. This government has committed over £6 billion between now and 2020/21 – which equates to just over £1 billion per annum – to local highway authorities in England, outside London, for local highways maintenance. This includes £250 million for a Pothole Action Fund. Ruth Cadbury MP was chairing the meeting and asked whether the Highways England proposal to cycle-proof all of their new roads can be extended to Local Authorities (LA). Robert Goodwill said this was the decision of Local Authorities and the DfT were encouraging each LA to have a cycling champion. He gave the example of Newcastle where the LA decided to close off a road to motor traffic despite opposition from motorists but they went ahead despite this. Flick Drummond MP asked how can funds be sought for a cycling specific transport survey in her constituency of Portsmouth. The Minister replied that the new Access Fund was the best option. Jo Somerset from Bikeright talked about the importance of cycle training. 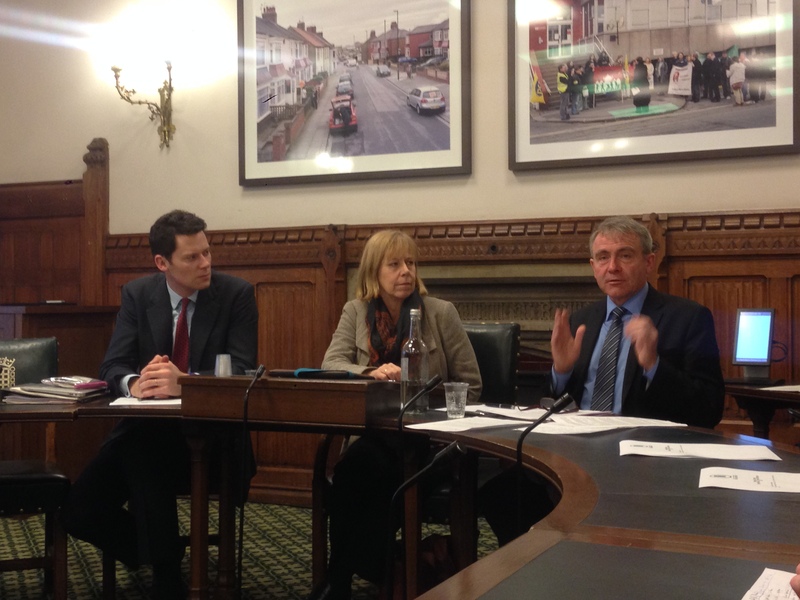 Robert Goodwill agreed and said that in cities there is a perceived fear of cycling and that more needs to be done to build segregated infrastructure. He added that the risk per kilometre travelled was the same for pedestrians and cyclists, but people don’t perceive walking to be dangerous. He said that the media give disproportionate coverage of cycling fatalities compared to pedestrian fatalities. He also added that cyclists must realise that they have just as much right to road space as motorists (something that is taught in Bikeability training) and as bikes are cheap to buy, there are no real barriers to owning a bicycle. David Davies from PACTS asked what the government intend to do about employees that don’t take road safety seriously. The Minister said that the bigger organisations train staff very well, and take incidents very seriously. HGV drivers now have to attend a compulsory training day, every year but other types of employees who drive lots of miles are not seen as professional drivers don’t get as much attention. He said they were a “harder nut to crack” as there is no legislation. Meg Hillier MP talked about riding with her 6 year old child on the backstreets of Hackney and said that segregation in London can be problematic. She suggested that planners need more guidance from the DfT on alternatives to segregation. The Minister replied that there are cheap ways of introducing segregation such as the ‘Armadillos’ being used in Camden. He said there needed to be more flexibility in signage and used the example that cyclist specific traffic lights used not to be legal, but are now. He also agreed to accompany Meg on a bike ride in Hackney to see what has worked well in her constituency. Paul Tuohy from the CTC talked about their recent ‘Big Bike Revival Project’ which encouraged people to use bikes that had been sitting in sheds. The Minister said that he was pleased that the DfT had funded this project. Mike Kane MP talked about how charity rides are a really good way to encourage cycling and the Minister agreed. Tessel van Essen from the Dutch Embassy said that all drivers have to learn about cycle awareness (not just HGV drivers, as in the UK). The Minister replied that awareness of cyclists appear in the written test of the Highway Code and that education applies to cyclists as well. He said: “I always wear hi-viz, to narrow the odds”. Robert Davis from the Road Danger Reduction Forum ask why the DfT didn’t report casualty rates (based on exposure) rather than pure casualties numbers which can be mis-understood. The Minister said he would look into this. Isabelle Clement from Wheels for Wellbeing wanted to see a review of the ‘invalid carriages regulation’ and add cycles into it and therefore recognise cycles as a mobility aid. She said there are a significant number of people who can ride, but due to a disability are unable to walk without the aid of a support such as bike. This can be a problem at railway stations, but the law should be changed to make it easier. Nick Chamberlain from British Cycling asked how the APPCG can hold the Government to account. Ruth Cadbury replied that we intend to hold other smaller inquiries to continue the work done with the ‘Get Britain Cycling’ report. The group have also had meetings with the Prime Minister and Secretary of State for Transport, during the last few months to discuss cycle safety and other key issues.